This week’s Flash is really all there in the title: “Honey, I Shrunk Team Flash.” I want to give major props to the show for finding a way to revisit the Savitar LEGO set from last season while still managing to editorialize the fact that keeping this model around in the first place is deeply dark and upsetting. We get to fold in another DC villain that is probably never going to make their way into the movie universe. Sylbert Rundine is the bus meta with the shrinking powers who was originally created as a villain for the Atom. But not just any Atom…Ryan Choi! (Sidebar: Ryan just happens to be my favorite Atom!) Sylbert goes by the name Dwarfstar as a hat tip to the dwarfstar alloy that is the origin of their powers. In the comics, Sylbert spends most of his origin skulking around Ivy University perpetrating some of the most heinous crimes out in the world. Considering the lighter tone that The Flash has adopted, I enjoyed them changing Dwarfstar into something more of a collector. He’s more like a version of Brainiac in “Honey, I Shrunk Team Flash” than his comic book progenitor. Shrinking buildings and vehicles simply because he wants something also helps to set up the gag of shrinking Team Flash members a few scenes into the episode. Dwafstar has also been a member of the Secret Six, which is a team that is perfectly poised to jump into the #DCTV Universe. We had a nod recently to the Outsiders (yay! ), and the Secret Six might be a cool, more villain-centric counterpoint. If you’ve never before read SECRET SIX, or might be into learning more about Sylbert Rundine during his time with them, then I would definitely recommend checking out the Gail Simone run on the eponymous title. I think “Honey, I Shrunk Team Flash” had a stroke of genius with the inclusion of “Bert,” as he is referred to throughout the episode. On the one hand, a shrinking foe is something new to The Flash and presents a fun opportunity for Cisco and Ralph to have to work together and build a solid house on top of the tenuous foundation that is their friendship. Plus, are there two more perfect characters to wind up miniaturized? The second clever thing about introducing Bert and presenting him the way that we do see him in this episode is how it fleshes out the Big Sir narrative. If you read my Couch Club piece last week, I touched on who exactly Big Sir is and what a great job The Flash did at updating this character for a modern television audience. “Honey, I Shrunk Team Flash” gives him a prominent subplot that infuses this character with a lot of humanity and even humility. The “hope” through line does feel very Supergirl-esque when it is first introduced, but by establishing that Big Sir is, confirmed, innocent, Barry Allen is able to preserve some more of his truly, deep down good guy integrity even from within the confines of Iron Heights. This B-plot is entirely facilitated by the existence of Bert and the physical similarities between the two characters. So much of season four of The Flash has dealt with these twelve new bus metas. 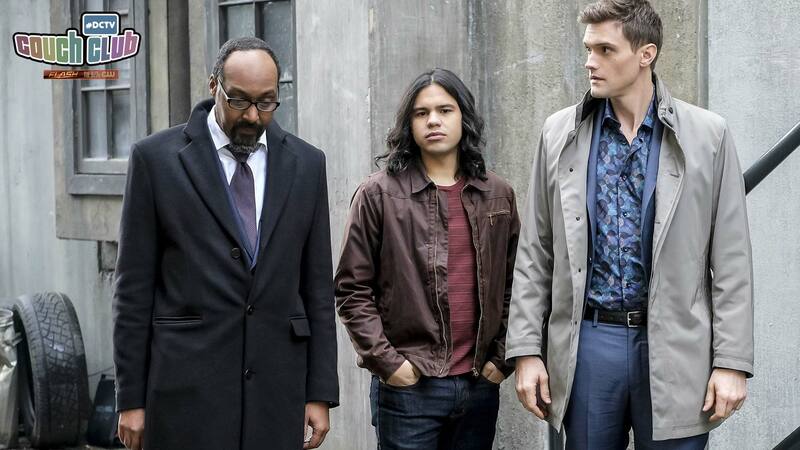 “Honey, I Shrunk Team Flash” found a nice balance between introducing a supervillain level threat for the characters of the show to deal with, while simultaneously illuminating the characters of both Barry Allen and Big Sir. That’s some pretty good stuff!